Built in 1974 and currently undergoing renovation. 28 floors with 218 units 584 sq. ft – 3495 sq.ft including penthouses. Utilities are all electric and there is no gas in the building. Most units have been renovated by individual owners and are custom to each unit. 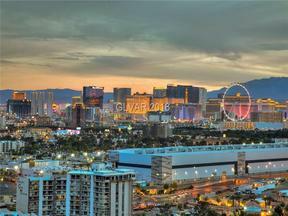 Regency Towers has some of the most spectacular views available in Las Vegas of the strip, mountains and the Las Vegas Country Club Golf Course. Sales in 2011 range from $52,000 to $425,000 for condos excluding penthouses. Include year round door and valet personnel from 7am to midnight. Swimming pool, two tennis courts, exercise room, saunas, spa and barbecue area. Regency Towers offers limited-use guest rooms at a nominal rate for resident’s. There are five guest rooms available, including one suite. Coin laundry on ground floor.